I'm not a huge pasta lover (i'm more of a fan of sauce) but every once in awhile I do love a bowl of pasta. 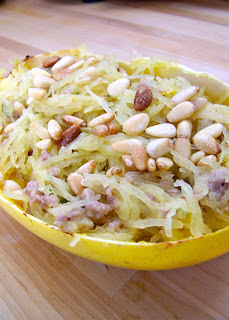 I will often go for gluten free pasta, but I love going the alternate route of spaghetti squash. Now, squash can be a little intimidating because it can take a really long time to cook, but I have a couple of tricks for you that will get this meal on the table for you in less than 45 min. Preheat your oven to 400 degrees F. Cut your squash in half lengthwise, remove the seeds and put the two halves face down on a cookie sheet with a lip all around. Add a thin layer of water to the pan and put in the oven. Cook for 25 min (the water and the face down combo makes the squash cook really fast). While the squash is cooking, saute the ground turkey and season with the garlic salt and pepper (I also sometimes add paprika) until the meat is cooked. Also, chop up your basil and toast your pine nuts (you can do this in a glass bowl in the microwave by cooking for about a minute and a half). Once the squash is done, remove it from the oven and let cool for about 10 minutes. Once cool, use a fork to remove the squash from the shell and put in a large bowl (save the shells as a fun bowl to serve the meal in). Add the meat, basil, sour cream and a little more garlic salt and pepper. Stir until the sour cream covers all the the squash and the meat and basil are well mixed in. 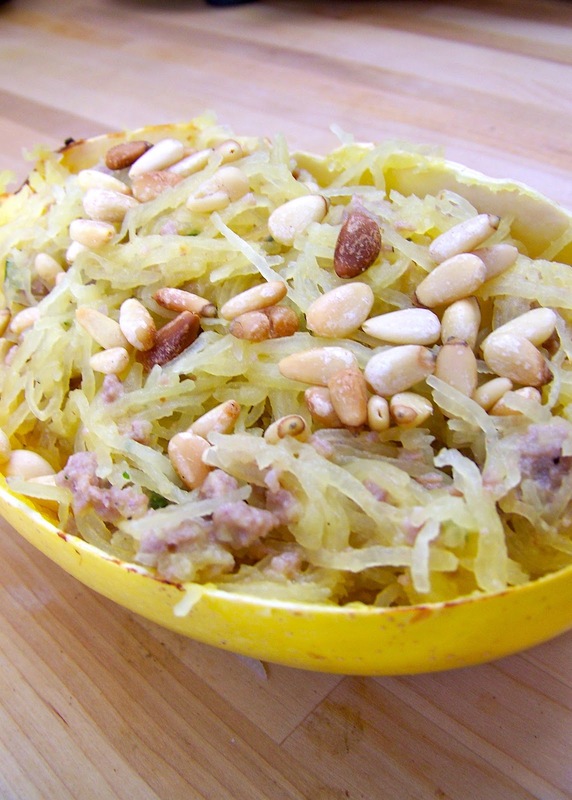 Scoop the squash into bowls or the left over shells and sprinkle with pine nuts. Enjoy!